Leaders everywhere, in arenas big and small, struggle with the desire and, frankly, the need to make sure their vision for the organization they have created or grown continues regardless of circumstances. And the question "what will be my legacy?" is a question all people ask themselves. Myles Munroe has observed that the tendency among leaders is to deal with this question as serious circumstances or retirement loom. Further, it is his belief that this is one of the most important decisions a leader will ever make. This book is a wakeup call. 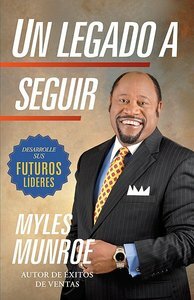 Myles Munroe wants all leaders to focus on building the right team for the future and to make it a top priority because the process is not a quick one. Properly mentoring the right people to ensure the continuation of an organization is actually a process that must be woven into that organization over a span of years or even decades. UN LEGADO AL SEGUIR shows how to use the concept of mentoring within an organization to value the distinct talents and abilities of the individuals. Mentoring is the pathway to developing leaders from within; leaders who are in line with the goals of the organization; leaders who are most likely to adopt and carry a vision forward. About "Un Legado Al Seguir (Passing It On)"